I have been dreaming about going to Machu Picchu for a few years now and the time had finally come. We opted to do the Loki jungle trek which was 4 days and 3 nights. I think it’s basically designed for the budget traveller and for one who isn’t prepared enough to book it 6 months in advance. 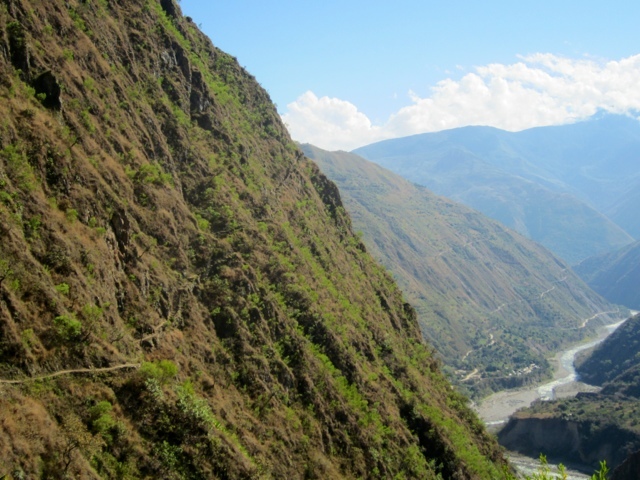 It also offered other things such as bike riding, rafting and zip lining instead of just straight hiking. 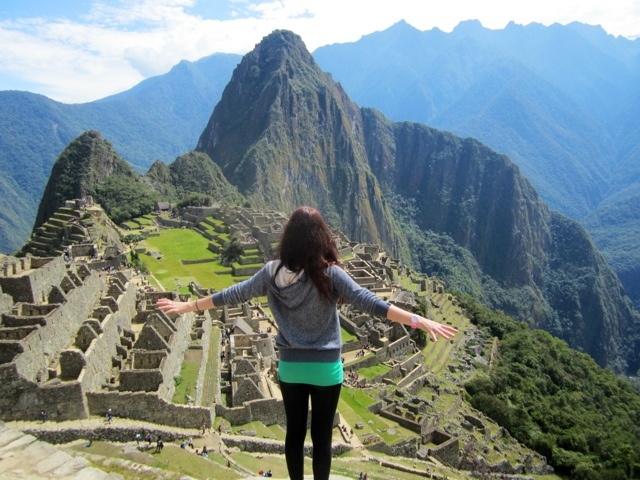 I would definitely recommend it to anyone thinking about doing a trek to Machu Picchu. The first day we were picked up from our hostel at 6:30am and driven for 3 and a half hours to a place called Abra Malaga which was 4,200 meters above sea level. 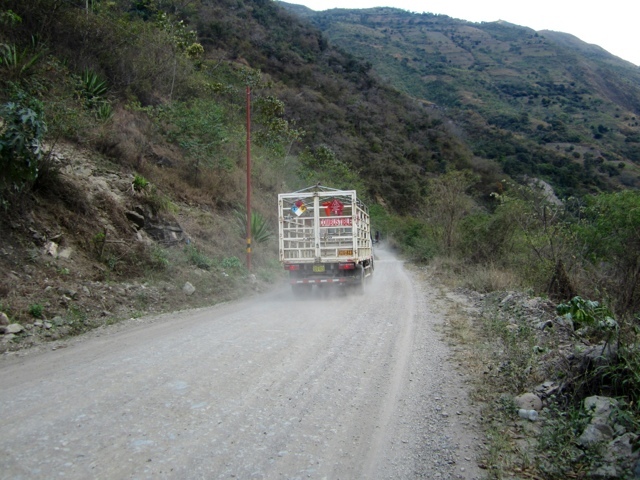 The road from Ollaytaytambo to Abra Malaga was insanely windy with switch back after switch back. I have never felt so carsick in my life! Finally we arrived amongst the clouds. We strapped on our ridiculous protective gear, chose a bike and hit the roads. It was such an adrenalin rush! The roads where very windy and there were cars so I was a bit scared and braked a lot around the corners so I was at the back of the pack but it was lots of fun. 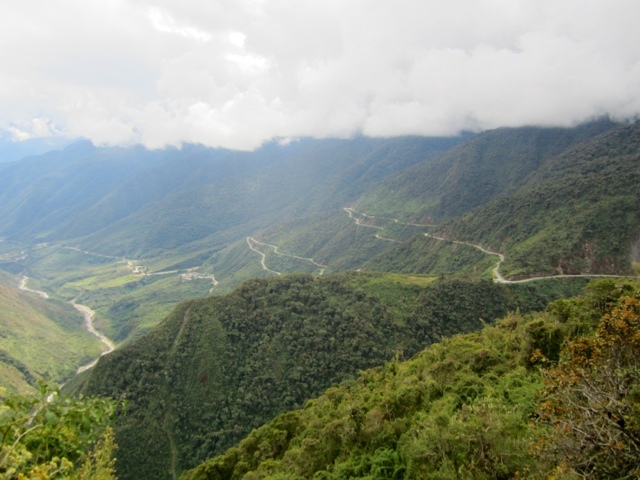 We descended 2,000 meters and went through several different types of weather. It was raining so hard for some of it I was soaking wet. All those typical travellers with their waterproof Kharki zip off pants I always laugh at had been really smart after all, leggings just didn’t quite cut it. I bet they didn’t have to sit around it wet pants all afternoon feeling like you’ve pissed your pants like I did. Yep, we biked down that crazy road!! After about 3 awesome hours of biking we arrived in a small town called Santa Maria where we stopped for a traditional Peruvian lunch. After lunch some of the group went to so white water rafting. We opted not to do it since I’ve already done it a few times an well…we’re saving our pennies for other things. The rest of us jumped into the back of a truck fit for cattle ad was driven to the fist part of our hike. We hiked for about an hour straight uphill to our first nights accommodation. I hated every moment of it and couldn’t help thinking whyyyyyyy did I do this. The poor boys had to help the locals carry food, sacks of potatoes and beer up the hill. I struggled with just my backpack! The views were so beautiful. Our home stay was quite nice too, literally in the middle of no where up a giant mountain. The bathrooms were really disgusting and I thought I might get dirtier rather than cleaner if I had a shower so baby wipes it was! After a nice dinner we headed to bed early to get lots of sleep for our biggest walking day. You can just see the path carved into the mountain that we just walked on. We stopped for a rest and our guide explained a lot to us about the Incan culture and the lands surrounding us. The rest of the day was spent walking through the jungle, stopping for lunch and walking right beside the Urabumba river along all the rocks. Some parts of the trek I thought ‘are you kidding me, we have to walk on this! ?’ At one point we had to get in a little cart that was pulled along a cable by a man to get us across the river. Im not sure how safe it was but it was definitely fun! Overall though, it was a lot easier than I had imagined and the views made my tired legs and blisters on my feet completely worth it. It was such a great day and it definitely didn’t feel like we walked 19km. It just flew by! 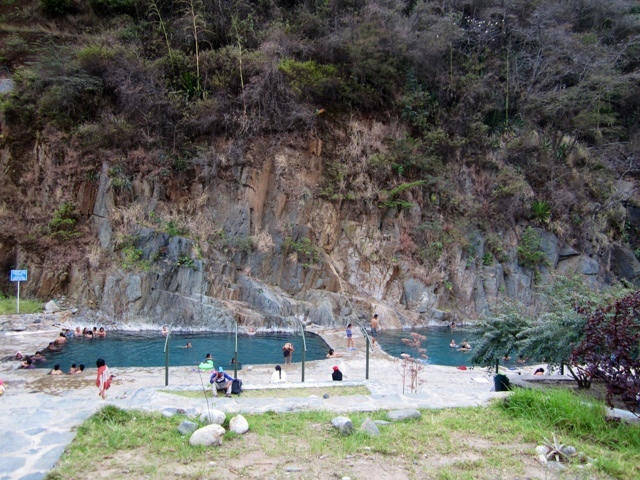 We finished the day by walking to the Santa Teresa hot springs. It felt so insanely good to rest our tired bodies in the fresh hot water and just chill out. After about two hours here we headed to our hostel for the night. The hostel was interesting. I don’t have high expectations when traveling but it was probably the grossest hostel I have ever stayed at. When we got into our room I noticed that it smelt like a toilet. Toilet spray mixed with poo. I said this to one of the other guys in the room who then informed me that one of the dogs in the hostel had just pooed on the floor and the lady had just cleaned it. Very hygienic haha. We locked the room and went for dinner and some much deserved beers. When we got back we unlocked the door and somehow there was a cat asleep on Toms pillow. We went to sleep to get ready for the next day. When I woke up the same cat was asleep on my bed, I have no idea how it kept getting in! Lucky I like cats! Some of the group went zip lining on the morning of the third day. Again we opted not to since I’ve already done it and I’m saving pennies. Apparently it was a amazing though. 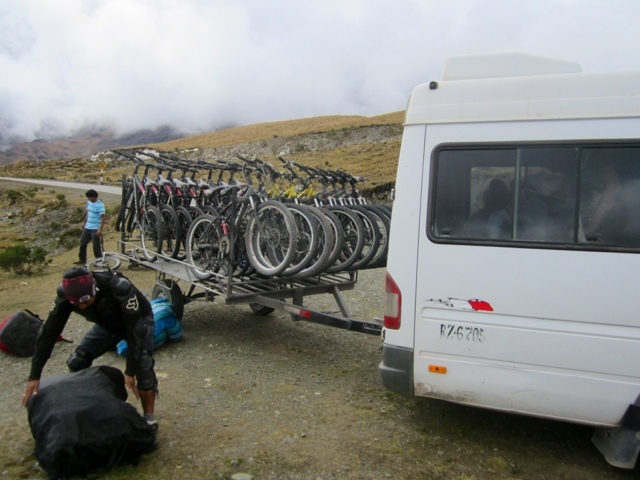 We regrouped for a short van ride to Hidroelectrica where we stopped for lunch. 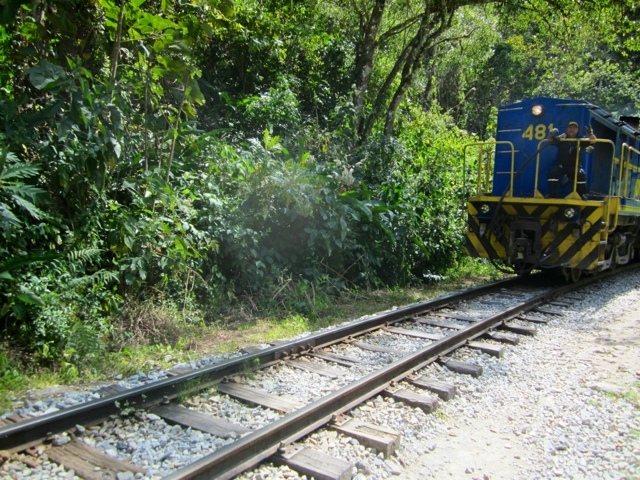 We then had a beautiful scenic walk for about three hours along the train tracks to the launching pad town of Machu Picchu called Aguascalientes. At one point we stopped on a bridge and the guide pointed to the top of the mountains “that’s Machu Picchu from behind” he said. I was so excited!! Aguascalientes is a beautiful little town, right by the river and surrounded by mountains. Our hostel was amazing! We got a private room with a tv and a hot shower!!! After not showering for three days I was just so excited to relax in the hot water. We had dinner and went to bed ready for a four am wake up for the inca staircase to Machu Picchu. 6am for our guided tour so it was a race against the clock. I’m so unfit I really thought I was going to throw up, but hooray I made it to the top in 50 minutes. Feeling excited and very sweating we anxiously waited inline to get into Machu Picchu. It’s hard to describe my feeling once I finally got in there and saw this wonder of the world through my own eyes. It was even more beautiful and breath taking than I ever could have possibly imagined. It was huge! It’s just so hard to understand how they built such a intricate and beautiful city. The backdrop of the mountains just makes it than even more magical. We stayed there for 6 hours and wandered around the ruins and just sat and took in the views. We snapped hundreds of photos and did our fair share taking photos for other travellers. We decided to walk the stairs from hell back down to Aguascalientes to get some pizza and catch the train and bus back to cusco. It’s safe to say I slept extremely well that night. Wow what an adventure. It’s a big fat tick against one of my goals. Next stop… Lago Titicaca!